Please Pre-Register so we have enough food. 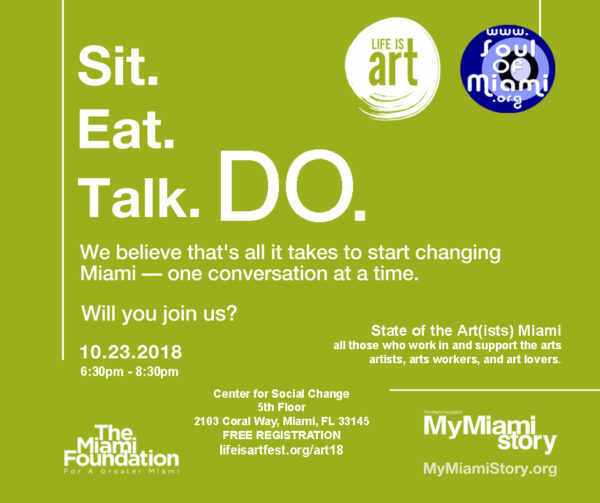 In conjunction with the Miami Foundation’s #MyMiamiStory, Life Is Art & Soul Of Miami are hosting a discussion of artists, arts workers, and art lovers. We welcome all those who work in and support the arts to discuss how things are going in Miami. We can talk about things like opportunity for paying work, sales trends, social commentary, community building, and any other artistic subjects you like. We especially want to hear from the artists, but everyone is welcome. Seats are limited. We ask that you pre-register so that we can have enough food and beverages. If you cannot attend, please un-register to make room for others. You are the Life of the Community and we want to hear from you. If you will attend, please also sign up as a My Miami Story conversation guest, so you receive a survey after our gathering. PS: This gathering will be live-streamed and a white paper will be produced describing specific actions for impact. PPS: James might be bringing some of his world-famous hand-made hot sauce.